We all agree with the fact that mobiles apps have revolutionized online retail, but did you know that they can also improve sales for in-store retail, enhance customer experience and drive loyalty. The new technology is blurring the lines between traditional bricks-and-mortar shopping and online shopping and making it more important than ever for retailers to embrace the mobile revolution. Most retailers today are ignorant about its importance and continue to let go of a lot of sales. How frequently do shoppers use retail app? According to a recent statistics, frequent mobile shoppers spend 25% more in traditional store than people who don’t use mobile frequently to help with the shopping. And 8 in 10 smartphone shoppers use mobile in-store to help with the shopping. What that means is that shoppers who use smartphone tend to spend more than those who don’t. Shoppers don’t just use it for price comparison but number of other activities like, finding product review, promotional offers, store location/ direction/ hours, product availability in store and may others. There was a time when online shopping was considered a threat for traditional shopping as users prefer the ease of browsing, comparing and paying online. But big online retail giants like ebay are looking for a physical presence, which means that consumers still rely on touch-and-feel of the product and would buy a product from the store rather than wait for online delivery if offered the right price. This infographic, courtesy adobe, illustrates how the mobile app usage is on the rise and what influences mobile purchasing decisions. What it means for Retailers? Mobile Retail app bridges the gap between online and in-store experience by allowing users to browse products physically, order them online using their mobiles and then have them delivered to them or pick up next day from the store. According to Google, 51% of online product searches ended in traditional purchases. And 20% of store-staff time is usually spent looking up inventory data. With Americans spending more and more time on their mobile phones, your presence on their Smartphone means increased chances of your brand awareness. Making your app “sharing friendly” on social media will ensure that the app promotes itself when it is shared, liked or talked about. Cross-channel promotion is likely to boost sales and improve ROI. 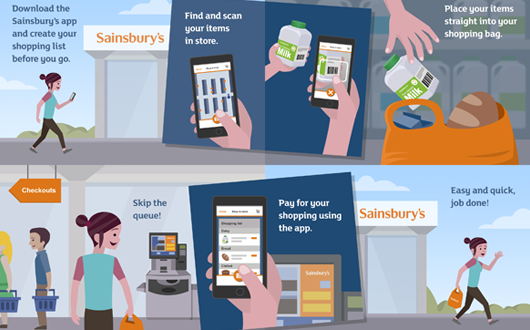 There are more ways for retailers to improve sales with app, like offering free wi-fi, strategy to purchase without getting in queues, in-store pick up and more. Retail employees are better equipped to assist customers in the store. Apps that are loaded with information on inventory, pricing, product feature and information like color or sizes, it the best way for the employee to add his sales pitch to drive sales by engaging and converting users with satisfaction. A good app means returning happy users. If your app is intuitive, provides value to your customers, makes effort to retaining loyal users and offers rewards and deals, they’ll keep using it. Creating a direct marketing channel to talk to your customers, means you can directly tell them about new products and promotions. Push notifications, feedback forms and customer segmentation based strategies will take you a long way. How Retailers can adapt quickly and easily? It’s simple! Contact Mofluid at https://mofluid.com/contact-us/ and we can help you build your own custom Retail Mobile App for an affordable price. You just need to provide a definite set of information like product and inventory data, and Mofluid team will take care of the rest! Mobile is here to stay, and the retailers that adapt to this trend quickly, efficiently and use it to improve the customer experience will have a great advantage over their competitors.